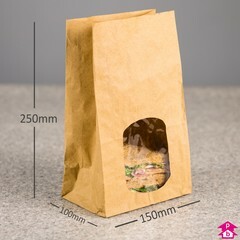 Present your sandwiches, pastries and other baked goods attractively in this Kraft paper sandwich bag. The large window allows customers to clearly view the contents giving visual appeal to your sandwiches and other baked treats. 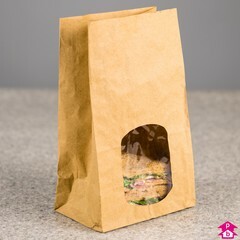 These brown paper sandwich bags are the perfect choice for showcasing ready-to-eat sandwiches; the gusset on the paper bag adjusts to fit two square-cut sandwiches allowing their filling to be displayed through the transparent window on the front face.